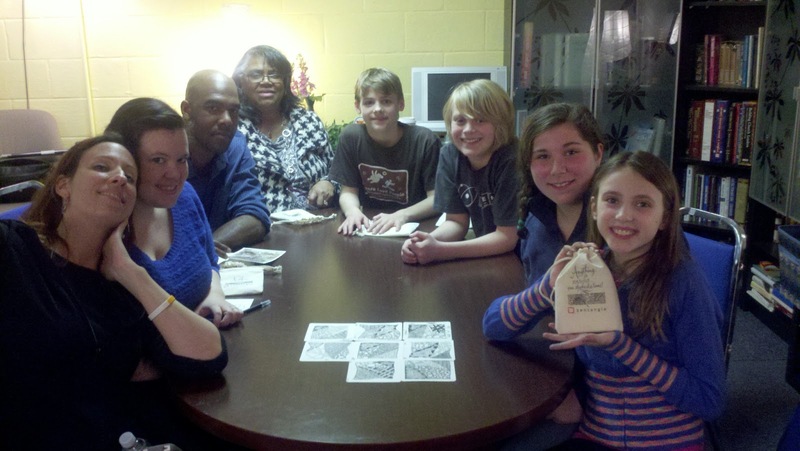 I got an email a while back from a mom/teacher/artist who thought it would be cool to have her 11 year old twins participate in a beginners class with a couple of friends and some family members. We had a fabulous time yesterday learning and sharing, and then I got to stay for some delicious cake! Have to hand it to Kat.... two birthday cakes every year! Anyway, below are photos of eight beaming faces and then a close-up of their mosaic. Left to right, the incredible artist mom, Kat... her uber-artistic friend, Kellee... her awesome husband, Daniel... her gracious mom-in-law Arlene... creative birthday boy, Nic... his friend (and encyclopedia of sea creatures) William ... artist-in-training, Mackenzie... and birthday girl, Sofia who follows in her mom's footsteps. Thanks to you all for a wonderful afternoon! I had a lovely experience today teaching 14 people in the organization of On Our Own of Howard County, Inc., in Columbia, MD. Below is a mosaic of their tiles. I would like to thank all who participated: Debbie (the coordinator), Kathryn, Mary Ann, June, Michelle, Wendy, Nugene, Debby, Leola, Kim, John, Jessica, Linda and Michelle. (Please forgive me everyone if I have spelled your name incorrectly.) 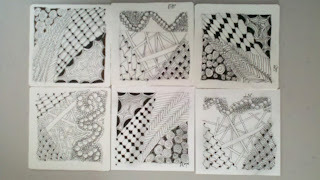 Perhaps we will do it again another time and learn some new tangles! It's interesting how my life changes direction now and then... and lately it seems to happen more often. And one change is my intention to keep this blog more current. 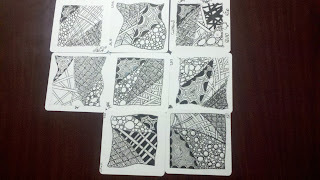 This past Saturday I had a class for five lively, creative women, and unfortunately neglected to have them combine their wonderful Zentangle tiles for a group photograph. I'd like to thank Libby for helping me schedule this event, Ivy for hosting at her home in Westminster, and Pat, Laura and Christine for adding their wonderful energies to the mix. As always, I learn things from my students, and this class was no exception. Thank you, wonderful women, for helping get me back on the track of expressing my creativity more fully. You have been an added inspiration! 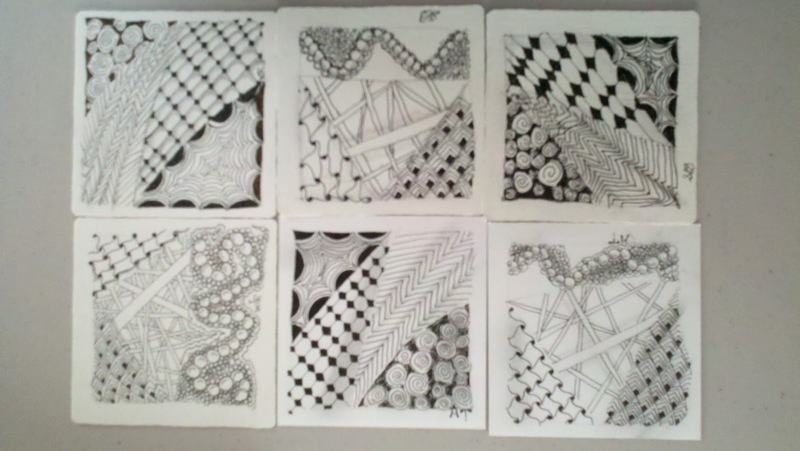 It's wonderful when I do not even market a class and people email me - "I got your name from the Zentangle website and want to know if you teach classes." Last week that is what happened, and since my friend Dee always offers a space at the Howard County Holistic Center if the activity room is free, Sally and Wendy gratefully attended. 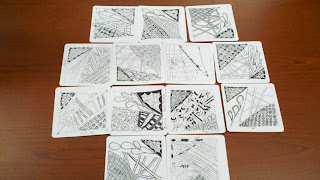 They have both been furiously doing Zentangle on their own without real direction, and were overjoyed to understand the process and realize where they can take it. 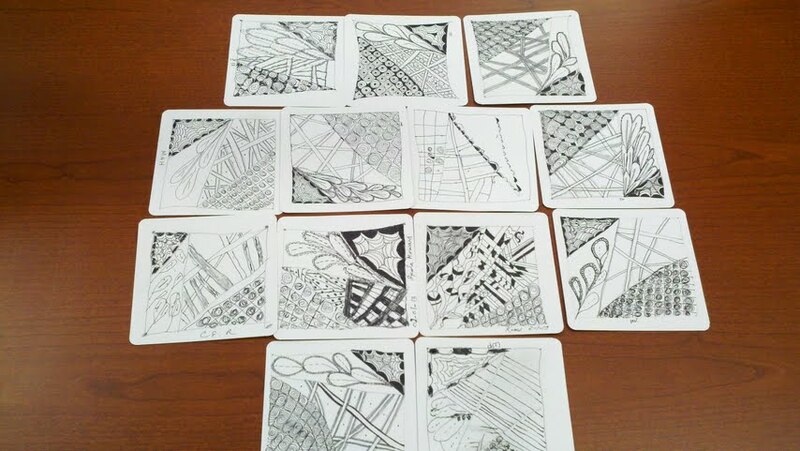 I am grateful for their interest and am grateful to send more students out with the knowledge of the true meaning and awesomeness of that which we call Zentangle. Recently I flew from East to West across this beautiful earth... and I believe it was the first time there were no clouds to obscure the view. The feeling of seeing Monument Valley and some of the Grand Canyon from 38K feet is not something that can be put into words. The mid-west was also a source of inspiration, because even with snow everywhere from Baltimore to the Rockies, the patterns we have carved and those that are naturally there still showed up. 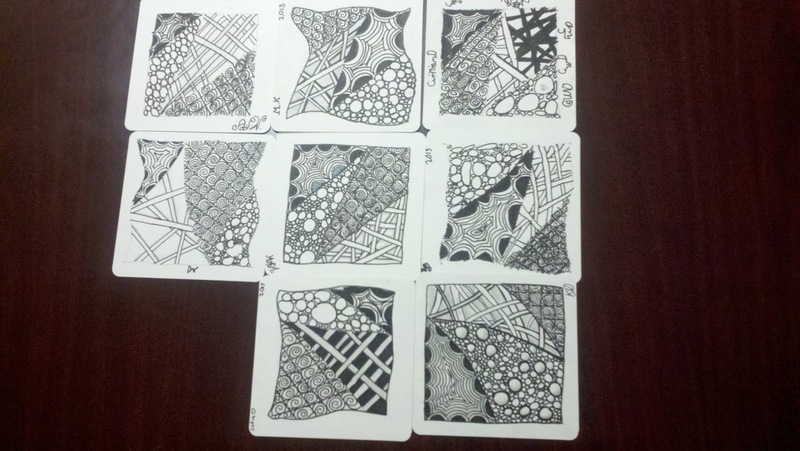 It reminded me of a Zentangle ensemble.